The temporary site where Russian devotees of the Hare Krishna Movement or ISKCON pray is likely to be demolished, Krishna.ru, a site run by Russian ISKCON followers said. The movement has faced several bureaucratic hurdles in its quest to have a permanent structure to conduct its religious activities. When the ISKCON temple situated near the Begovaya metro station (in the centre of Moscow) was demolished in 2004, the Moscow government allotted land for construction of a new temple at the Leningradsky Prospekt (north of Moscow). This land was subsequently taken away. In 2006, the Moscow government promised to build a temple in the Molzhaninovo district (10 km from the Moscow ring road) as part of the joint declaration signed by the Moscow and New Delhi governments. A Russian Orthodox Church has since been built in Delhi. Despite all clearances for the project for the temple to be built in Molzhaninovo, the Moscow government cancelled the project. The authorities of the Northern administrative district of Moscow have also threatened to demolish the temporary site where Moscow-based ISKCON followers pray. 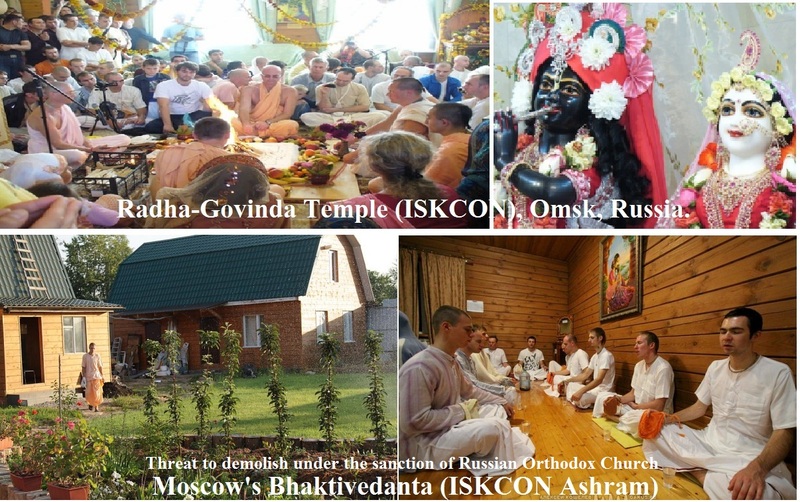 Moscow is believed to have 20,000 followers of the ISKCON movement.